Microsoft PowerPoint 2016 is quite similar to the 2013 and 2010 version of this presentation program from Microsoft. So if you are familiar working with those version, you should not have too much of a problem creating a new presentation in the 2016 version of Microsoft PowerPoint. 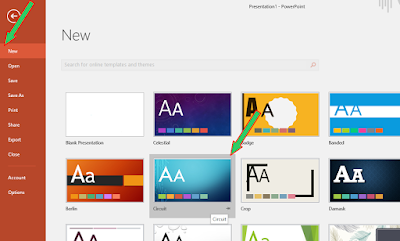 Although we created this explanatory guide for those who are new to the PowerPoint program, you too who is familiar with the program can still find the article helpful. For starters, what you should know and always keep in mind is that, any document created with the Microsoft PowerPoint program is called Presentation. So when we are talking about creating a new presentation in Microsoft PowerPoint, we are referring to creating a new PowerPoint document. To easily identify a Microsoft PowerPoint document, all its document are saved with .ppt file name extension. Open an already created and saved presentation for preview or for further editing. Create a new presentation from scratch or from pre-designed presentation called template or theme, which are saved to your computer when you install the PowerPoint 2016 program or those which are available online in the Microsoft online template store. You can also using the PowerPoint 2016 Help icon to search for tutorial guide from Microsoft Online. And you can choose to sign into PowerPoint 2016 program whit your Microsoft 365 or Outlook/Hotmail account so that you can access or save your new presentation into Microsoft cloud service –One drive, and others. We will not explain in detail how to perform all this option at this stage, what we will be focusing on is how to create a new document/presentation, and this task is not quite difficult. As mentioned above, you have two option when you wish to create a new presentation in Microsoft PowerPoint 2016 program, and the options are: either you create the new presentation from scratch or you use a pre-design template. Creating a New Presentation From Scratch Using The PowerPoint 2016 Welcome Screen. 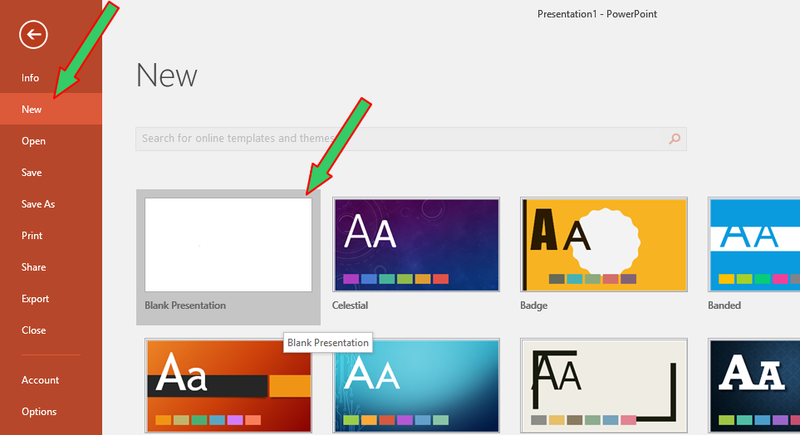 Now click on the Blank Presentation thumbnail which is the first among the different thumbnail in the welcome screen as shown in the image below. Once done, a new blank presentation window will appear, and from there you can start your project. Creating a New Presentation From Scratch From A Current Presentation Window. Click on the File tab in the Ribbon of Microsoft PowerPoint 2016 to go to the Backstage view of PowerPoint 2016, as illustrated in the image below. When on the Backstage view, select New from the options in the left section of the window and then click on the Blank Presentation thumbnail. Once done, a new blank presentation window will appear. Note that, you do not need to exist the previous presentation window to do this. And also, when this new presentation window appears, it will not overwrite the previous one, and thus you can work on both of them simultaneously. 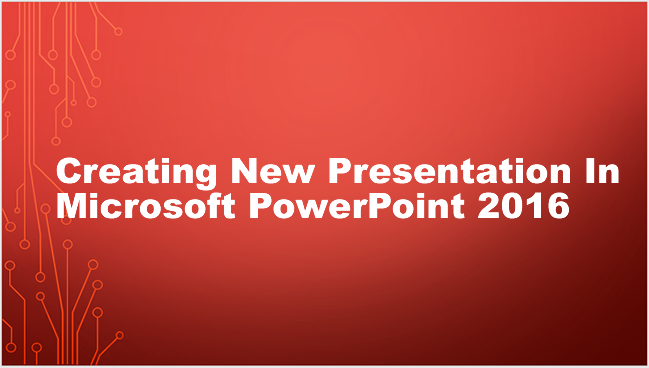 Creating a New Presentation From a Template Using The PowerPoint 2016 Welcome Screen. To create a new presentation from a local saved template in Microsoft PowerPoint 2016 Welcome Screen, do the following. Launch the Microsoft PowerPoint 2016 program. While in the Welcome screen, click on any template thumbnail of your choice in the list on the welcome screen (you can also use the search box to search for template which are saved in your computer but does not appear on the list) to preview it. A preview dialog box will appear which will give you further information about the template. If you like the template design, click on the Create button in the preview dialog box to create the new presentation with the selected template style. Creating a New Presentation Using Template From a Current Presentation Window. Click on the File tab in the Ribbon to go to the Backstage view of Microsoft PowerPoint 2016. When in the Backstage view, select New from the options in the left section of the windows and then select any of the template thumbnail of your choice, in the list on the Backstage view (you can also use the search box to search for template which is saved in your computer but does not appear on the list, or to search for online templates if your computer is connected to the internet) to preview it. A preview dialog box will appear which will give you further information about the template. 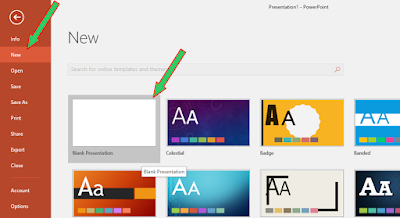 Click on the Create button in the preview dialog box to create the new presentation with the selected template style.